Much of nanoscience and many nanotechnologies are concerned with producing new or enhanced materials. Nanomaterials can be constructed by top down techniques, producing very small structures from larger pieces of material, for example by etching to create circuits on the surface of a silicon microchip. They may also be constructed by bottom up techniques, atom by atom or molecule by molecule. One way of doing this is self-assembly, in which the atoms or molecules arrange themselves into a structure due to their natural properties. Crystals grown for the semiconductor industry provide an example of self assembly, as does chemical synthesis of large molecules. A second way is to use tools to move each atom or molecule individually. Although this ‘positional assembly’ offers greater control over construction, it is currently very laborious and not suitable for industrial applications. Check out our detailed article on how nanoparticles are made. It has been 25 years since the scanning tunneling microscope (STM) was invented, followed four years later by the atomic force microscope, and that's when nanoscience and nanotechnology really started to take off. Various forms of scanning probe microscopes based on these discoveries are essential for many areas of today's research. Scanning probe techniques have become the workhorse of nanoscience and nanotechnology research. Here is a Scanning Electron Microscope (SEM) image of a gold tip for Near-field Scanning Optical Microscopy (SNOM) obtained by Focussed Ion Beam (FIB) milling. The small tip at the center of the structure measures some tens of nanometers. Current applications of nanoscale materials include very thin coatings used, for example, in electronics and active surfaces (for example, self-cleaning windows). In most applications the nanoscale components will be fixed or embedded but in some, such as those used in cosmetics and in some pilot environmental remediation applications, free nanoparticles are used. The ability to machine materials to very high precision and accuracy (better than 100nm) is leading to considerable benefits in a wide range of industrial sectors, for example in the production of components for the information and communication technology, automotive and aerospace industries. If 50% or more of the constituent particles of a material in the number size distribution have one or more external dimensions in the size range 1 nm to 100 nm, then the material is a nanomaterial. It should be noted that a fraction of 50% with one or more external dimensions between 1 nm and 100 nm in a number size distribution is always less than 50% in any other commonly-used size distribution metric, such as surface area, volume, mass or scattered light intensity. In fact it can be a tiny fraction of the total mass of the material. Even if a product contains nanomaterials, or when it releases nanomaterials during use or ageing, the product itself is not a nanomaterial, unless it is a particulate material itself that meets the criteria of particle size and fraction. The volume specific surface area (VSSA) can be used under specific conditions to indicate that a material is a nanomaterial. VSSA is equal to the sum of the surface areas of all particles divided by the sum of the volumes of all particles. VSSA > 60 m2/cm3 is likely to be a reliable indicator that a material is a nanomaterial unless the particles are porous or have rough surfaces, but many nanomaterials (according to the principal size-based criterion) will have a VSSA of less than 60 m2/cm3. The VSSA > 60 m2/cm3 criterion can therefore only be used to show that a material is a nanomaterial, not vice versa. The VSSA of a sample can be calculated if the particle size distribution and the particle shape(s) are known in detail. The reverse (calculating the size distribution from the VSSA value) is unfeasible. This classification is based on the number of dimensions of a material, which are outside the nanoscale (<100 nm) range. Accordingly, in zero-dimensional (0D) nanomaterials all the dimensions are measured within the nanoscale (no dimensions are larger than 100 nm). Most commonly, 0D nanomaterials are nanoparticles. 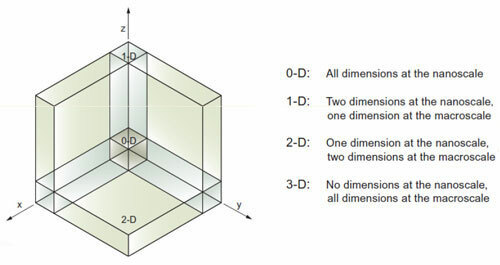 In one-dimensional nanomaterials (1D), one dimension is outside the nanoscale. This class includes nanotubes, nanorods, and nanowires. In two-dimensional nanomaterials (2D), two dimensions are outside the nanoscale. This class exhibits plate-like shapes and includes graphene, nanofilms, nanolayers, and nanocoatings. Three-dimensional nanomaterials (3D) are materials that are not confined to the nanoscale in any dimension. This class can contain bulk powders, dispersions of nanoparticles, bundles of nanowires, and nanotubes as well as multi-nanolayers. Some of these materials have been available for some time; others are genuinely new. The aim of this chapter is to give an overview of the properties, and the significant foreseeable applications of some key nanomaterials. Two principal factors cause the properties of nanomaterials to differ significantly from other materials: increased relative surface area, and quantum effects. These factors can change or enhance properties such as reactivity, strength and electrical characteristics. As a particle decreases in size, a greater proportion of atoms are found at the surface compared to those inside. For example, a particle of size 30 nm has 5% of its atoms on its surface, at 10 nm 20% of its atoms, and at 3 nm 50% of its atoms. Thus nanoparticles have a much greater surface area per unit mass compared with larger particles. As growth and catalytic chemical reactions occur at surfaces, this means that a given mass of material in nanoparticulate form will be much more reactive than the same mass of material made up of larger particles. To understand the effect of particle size on surface area, consider an American Silver Eagle coin. This silver dollar contains 31 grams of coin silver and has a total surface area of approximately 3000 square millimeters. If the same amount of coin silver were divided into tiny particles – say 10 nanometer in diameter – the total surface area of those particles would be 7000 square meters (which is equal to the size of a soccer field – or larger than the floor space of the White House, which is 5100 square meters). In other words: when the amount of coin silver contained in a silver dollar is rendered into 10 nm particles, the surface area of those particles is over 2 million times greater than the surface area of the silver dollar! In tandem with surface-area effects, quantum effects can begin to dominate the properties of matter as size is reduced to the nanoscale. These can affect the optical, electrical and magnetic behavior of materials, particularly as the structure or particle size approaches the smaller end of the nanoscale. Materials that exploit these effects include quantum dots, and quantum well lasers for optoelectronics. For other materials such as crystalline solids, as the size of their structural components decreases, there is much greater interface area within the material; this can greatly affect both mechanical and electrical properties. For example, most metals are made up of small crystalline grains; the boundaries between the grain slow down or arrest the propagation of defects when the material is stressed, thus giving it strength. If these grains can be made very small, or even nanoscale in size, the interface area within the material greatly increases, which enhances its strength. For example, nanocrystalline nickel is as strong as hardened steel. Understanding surfaces and interfaces is a key challenge for those working on nanomaterials, and one where new imaging and analysis instruments are vital.